"Kinderspiel" by Michael Mao. Photo by Steven Pisano. 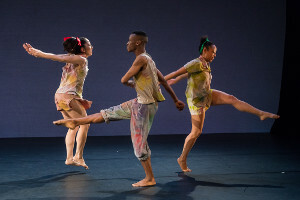 Michael Mao Dance celebrated its 25th anniversary at New York Live Arts April 26 to 28 with a four-part retrospective of past works that included "Kinderspiel" (2000), "Weaving" (1999), "Shifting Shades" (2012-18) and "Still Night" (1993). It was an evening of precise, abstract, super-contemporary dance and music visualization, not strictly tied to a single technique -- a mid-career review with the feeling of an abstract painter at work. Concepts got more complex as the evening went on, giving us the sweep of life: from kids playing to the migration of our souls. Mao uses few strokes to express an idea. I likened his touch to calligraphy--essential strokes. "Kinderspiel" looks back fondly on child's play. The ensemble enters skipping; the girls have ribboned hair. Costumes (revised by George Hudacko) are grey and stained. (Kids do stain their clothes, don't they?) Music is by Felix Mendelssohn. Mao very cleverly choreographs children's games. There is lots of frilly chasing back and forth. We see his dancers in unison and as individuals. When they are balancing, they are allowed to tremble and stumble--like children. "Weaving" is a dance in burgundy costumes by Andrea Huelse. It starts with two couples, all men, partnering to a percussive score by Leonard Eto. The dance is a nonstop, high energy test of stamina. I note touches of whimsy. Everybody seems tall in this dance; well, medium-tall. Occasionally, dancers rest on the floor. The score starts with only beats, later it is augmented by voices. Overall, the dance is exact, precise and fiery. The audience responds energetically to its exuberance. I'll take a chance and compare "Shifting Shades" to Plato's cave, calling it a dance of shadows on a back porch as the wind blows. It is performed in torn costumes by George Hudacko to a modernist score of the same name by Huang Ruo. A whistle enters the score in counterpoint, and the dancers move directly to it. Women dancers enter blowing into bottles (Whooo! Whooo! Whooo!). The lighting by Will Knapp organizes the action into four, then five pools of light laid out like spots on dice. We hear cymbals and blocks. It's all very concrete yet there is a meditative, ritualistic quality overall. In "Still Night," the whole company enters in white costumes by Lynne Steincamp and are backlit. Some sit in the front rows of the audience. The music by Arvo Pärt, "Stabat Mater," has a liturgical feel. There is lots of movement in unison (my notes say "formation flying") and some slow-slow-slow partnering by a lead duo: Virginie Mecene and Kevin Predmore, who are alumni of Mao's company who went on to become featured dancers with Martha Graham. In the dance's conclusion, the whole ensemble reappears onstage as if out of nowhere, seeming to say "We are always walking with our departed." That image, along with the five pools of light in "Shifting Shades," remains with me to this day.